Impex's line of classic RCA Living Stereo releases now includes the inimitable vocal stylings of Harry Belafonte singing the timeless words and music of American blues in truly breathtaking sound. Available for the first time on 180g 45RPM 2LP, this definitve pressing was mastered by Kevin Gray, includes a historical essay insert and packaging, and is individually numbered and strictly limited to 2,000 pieces. Belafonte Sings the Blues was recorded over four sessions during the first half of 1958, and released by RCA later that year. The album features thrilling performances of numerous Billie Holiday, Johnny Mercer, and Ray Charles songs, interpreted in a way that only Belafonte can. 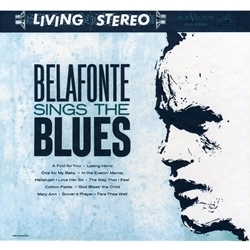 The blues are close to Belafonte's heart and it clearly shows here on his renditions of such classics as "One For My Baby", "Cotton Fields" and "God Bless the Child" among others! " Impex Records offers Harry Belafonte's ground-breaking blues set available for the first time on 45rpm 180g Vinyl, featuring exclusive historical essay insert on an elegant 84 lb pearlized paper stock and gorgeous high resolution mastering by Kevin Gray at AcousTech Mastering. "When I started singing," Belafonte explains, "I was involved with an enbironment that emphasized the modern school of jazz, and it was difficult for me to adapt the way I felt to the requirements of that kind of singing. But that was what I was exposed to at the time. I've always had a feeling for the basic blues, but it took several years of removing myself from the predominantly modern jazz environment and finding myself and my own set of balues before I had teh courage to attempt an album like this. Here I can just step out and sing wholly the way I feel." The blues are close to Belafonte's heart and it shows in the way he delivers such tunes as "One For My Baby", "Cotton Fields" and "God Bless the Child" among others. Recorded in New York, January 29, 1958, March 29, and in Hollywood June 5 and 7, 1958.